HERMAN'S HERMITS - BEST OF,THE VERY 2 CD 56 TRACKS BRIT POP COMPILATION NEW! 4 product ratings - HERMAN'S HERMITS - BEST OF,THE VERY 2 CD 56 TRACKS BRIT POP COMPILATION NEW! THE J.B.'S - FUNKY GOOD TIME/ANTHOLOGY 2 CD 30 TRACKS POP / R&B BEST OF NEW! 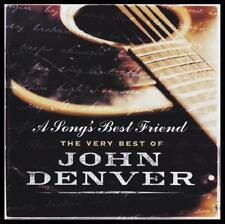 JOHN DENVER - A SONG'S BEST FRIEND-THE VERY BEST OF JOHN DENVER 2 CD NEW!